Historically, the main focus of recruitment agencies was to streamline the process of receiving resumes and progressing candidates through the screening and matching stages, in order to find a candidate to fill a role as quickly as possible. This resulted in a poor candidate experience; according to the Forrester Blog in 2018, 83% of applicants judged the whole experience to be quite poor. Alarmingly, 45% of candidates never heard back from a recruiter after entering the recruitment process. A successful recruitment agency must learn to manage these issues in a more innovative way. Sometimes, being a successful in recruitment is all about predicting the future, or asking the right questions such as which industry will be hiring the most which profiles will be most in demand? questioning whether the CRM system in use adds any value? In 2018, as a result of the many industry reports and surveys of the past few years, the recruitment industry turned its focus towards candidate satisfaction. This new focus has led to CRM and software manufacturers deploying features specifically designed to increase the quality of the candidates experience. This year the focus has shifted to the future; future technologies such as artificial intelligence, virtual reality and machine learning, with a progression towards making the platforms more intelligent. Filling a particular job role with the right talent is, and will remain, the core challenge of recruitment agencies. Is an intelligent CRM the competitive advantage to find that rare talent faster? 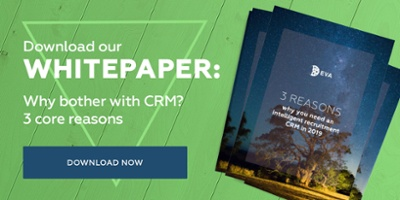 Download our white paper to look at three reasons why an intelligent CRM might just be the answer.